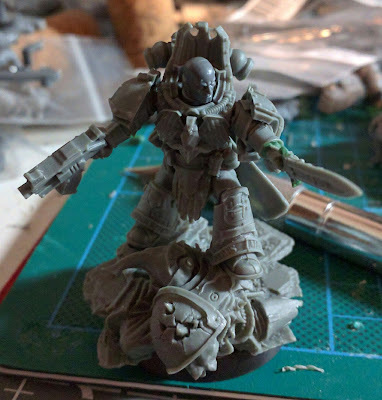 Given I now have Nathaniel Garro, This little fellow will now become my Knight Errant model. I have worked on the sword, the face and started work on the robes. Progress continues of Krom. First up with Vallejo Model Color Brass. Next a wash of Vallejo Game Color Wash Sepia, the usual recipe for the rest of the gold areas. 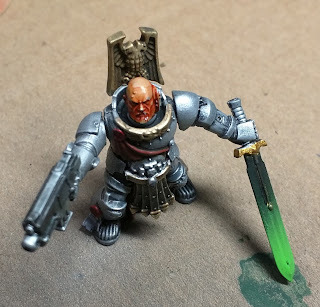 The axe head had a base of Vallejo Model Color White and I put a base of Vallejo Game Color Dwarven Flesh, for the face. The axe head then got a dilute shade wash of Vallejo Game Ink Blue. The face got a wash of Vallejo Game Ink Flesh Wash.
Dagr is complete. Just a coat of varnish, tidy the base border and a single decal, for the shoulder pad, and he is ready for the tabletop. It's a long way from his humble beginnings, in grey plastic, hey? So I was reading through Angels Exterminatus, and I eventually came to the conclusion that I had to do something about Sharrowkyn's backpack. Initially I painted a MkIII backpack, the I decided that wasn't right, so I painted a MarkIV backpack. 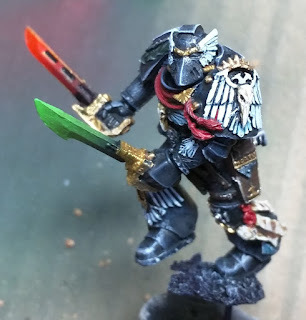 Then, after finishing Angels Exterminatus I just bit the bullet and went for a Heresy jump-pack, kit bashed from the Sanguinary Guard jump-pack. Sharrowkyn does way too many cool vector thrusts with his jump-pack whilst grabbing the Maugetar Stone from Lucius not to display it. Bearing this in mind, I cracked out the green stuff and set about customizing the look of the jump-pack. Below are a few shots of how it has turned out, thus far. First up building a raven across the shoulders. Second, I added a Raven Guard icon to the centre line of the exhaust housing. So I kind of hinted that my Garro might end up a bit of a generic Knight Errant, in favor of the real thing. Well you guessed it. 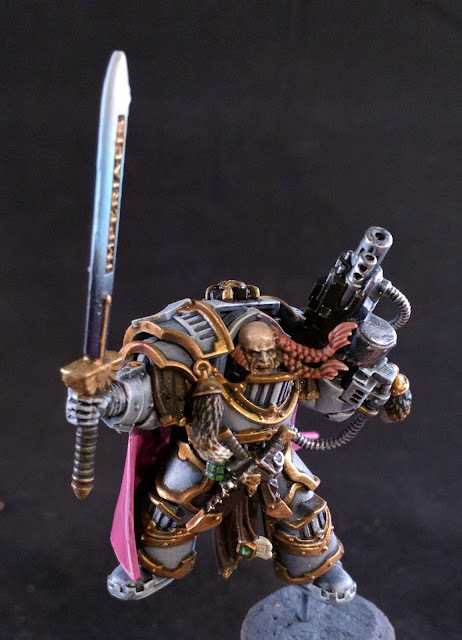 I got my hands on the real "Nathaniel Garro". Things being what they are with me, I wasn't the biggest fan of how Libertas was a trailing after thought, so I repositioned the sword arm to take centre stage. The following picture is how I am currently thinking of positioning Garro, looking down Libertas' blade edge. 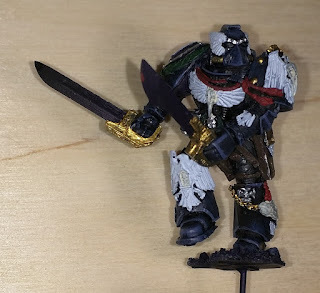 What do you do when you're about finished on a model and somehow it gets chipped or broken? Darn it! Is probably the first thing you say, maybe with a few more colorful expletives. Now I have to go and carefully snap off the broken sword, find a replacement, paint it up and reattach. 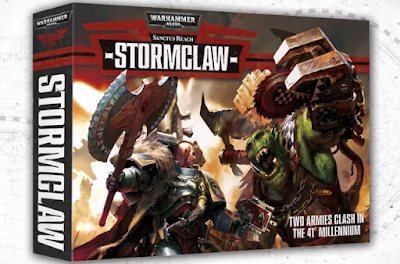 A few years ago, Games Workshop came out with the Stormclaw boxed expansion set, featuring the Space Wolves of the Drake Slayers and an Ork horde. 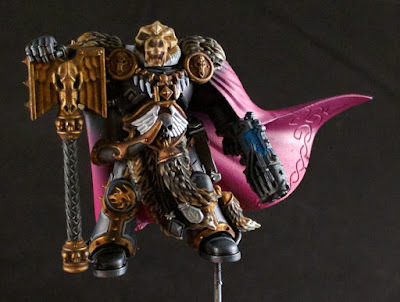 As part of this Krom Dragongaze was the first character figure produced by Games Workshop in many years. I picked one up at the time, but never got around to painting him. 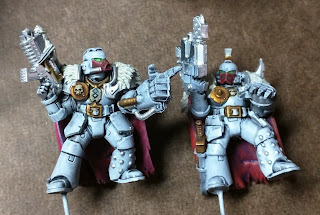 Given all my recent activity painting the Wolves, I thought it was probably high time to dust off the grey plastic and slap a coat or two of paint down. The usual recipe. Vallejo Dark Grey Polyurethane primer, Vallejo Game Air Sombre Grey base. Following this, I layered in Vallejo Game Color Wolf Grey, followed by an extreme edge highlight of Vallejo Game Color Ghost Grey. Time to dig into the detailing. Starting with grey Vallejo Grey Polyurethane Primer, then Vallejo Model Air German Dark Grey, shade washed with Blacklining wash. The black of the armor is complete, basics of the gold shaded and just needs highlighting, fur skins blocked in. I even got time to work on the cloak. 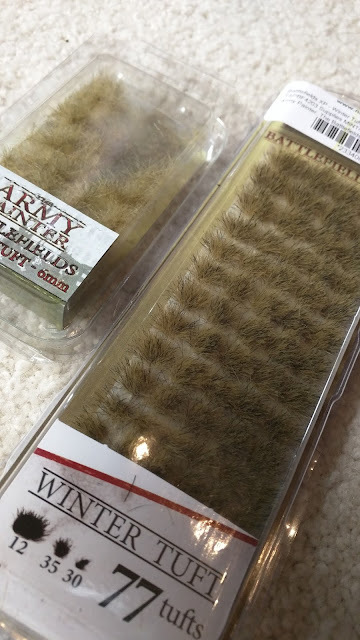 This time I used the airbrush for more subtle highlights. Still more to be done, but the finish line is getting closer. Progress on my take of Garro continues. 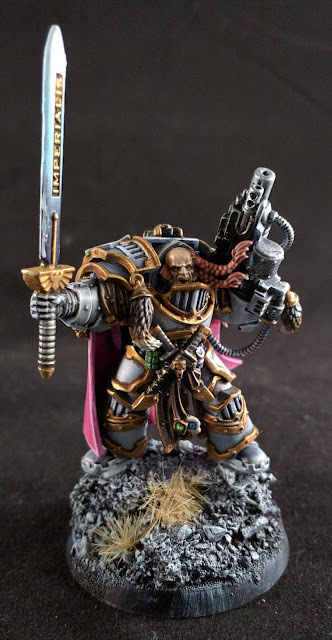 Initially I wanted to paint him a Dark German Grey and highlight up, but looking back at the Forgeworld images and listening to the Audio books, it is more apparent that Garro runs in unadorned gunmetal armor.So I switched from a dark grey to the silvered look. Still more to come on this one. Maybe I will play him as a stock Knight Errant with stats from Book 6. Why not play him as Garro, you may ask ? Well that's because I might have the real one coming. 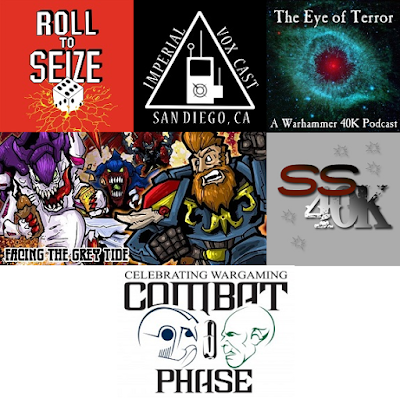 General Ramblings #20 - What to Play? So it's a slow afternoon, and you have a few games sitting around. You're a little burnt out by the speed of what 40k is expanding at, so you look for a little more control over the situation. Well, on this particular, I reached for the self-contained world of the board game, namely Betrayal at Calth. Now a lot of critics say that this game is just a "kitty grab" for plastic Heresy miniatures, I would say otherwise. There is actually a pretty good game in this box! Betrayal at Calth (B@C) is James M Hewitt's first outing at Games Workshop. 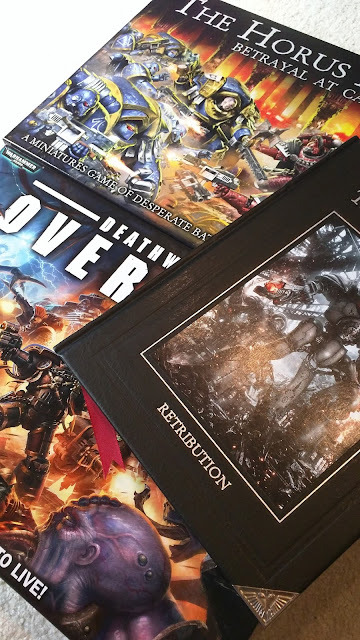 After moving over from Mantic and working with Jake Thornton on Deadzone, Mr. Hewitt's first game has distinctive hallmarks of his style. 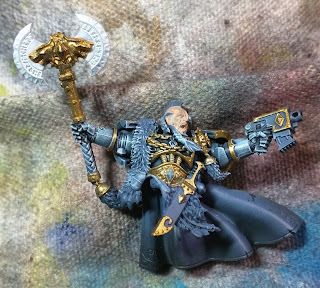 But with Games Workshop behind him, there has been a lot more polish. Unfortunately, in the rush to get this strong game into printing, the rules book fluffed a few points, which has been later picked up by their latest B@C FAQ. Overall progress on the Vlka Fenryka, thus far. 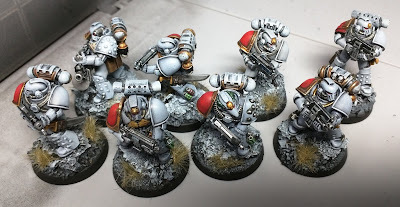 Two squads of Grey Hunters, Veteran Tactical, and a Contemptor. I will post up better pictures once I finish up with the decals. 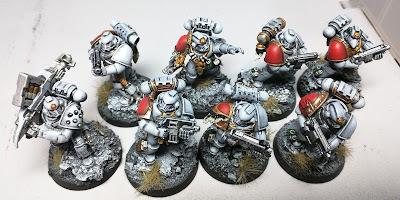 Now if I add my twenty (20) 40k Bloodclaws, which could double as Destroyer Squads, I might have a the basis for an army. 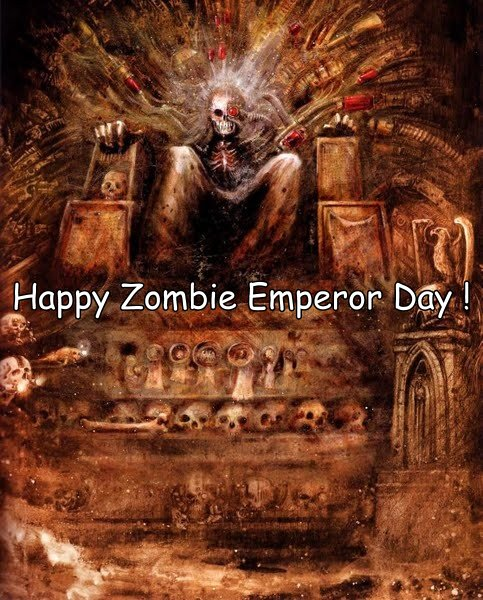 Oh heck who am I fooling, I need a transport, for the table top, otherwise I go hard into Zone Mortalis. Second squad is done, shoulder pads and backpacks. 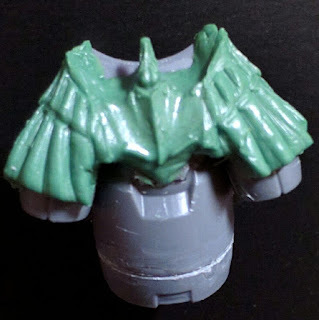 Looking back and thinking about it, I might fix the left shoulder pad trim, put on some brass detail. Once I have finished that up, I will get onto the decals. Shoulder pads and back packs on the first squad are done. Time for doing the decals. I think I will make that into a whole new thread, as decals can be a bit fiddly. Simply go down to you local Lowes or HomeDepot and visit the paint section. They have paint stirring sticks at the counter, that are free. Grab a few of them. 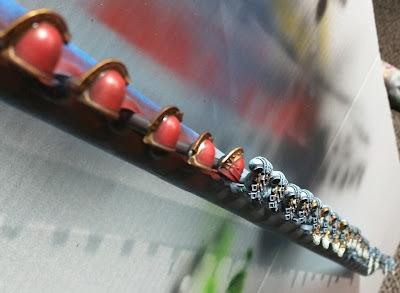 Poke as many poster pins as you can fit, leaving about an inch between each one.Grab your poster-putty break off little portions and roll them into balls, finally push them onto the tops of the poster-pins. 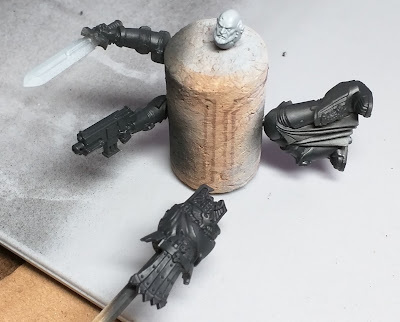 Once you have done this, attach your backpacks and shoulder pads and get stuck into priming and painting. Continued progress on Sharrowkyn. 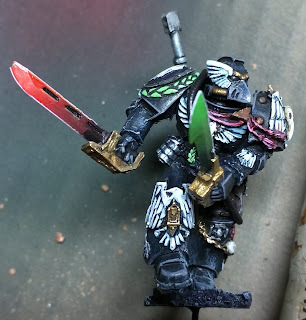 This time work on the second sword and extreme edge-highlights. Time to get stuck into the detailing. All hobbyists like to collect. And in that collecting you end up with a few more models than you can work on at once. With new releases this number continues to grow, and you end up with a backlog. Bearing this in mind, I decided to make an attempt to clear some of this backlog. Assembling, cleaning mold-lines, washing in warm soap, etc. 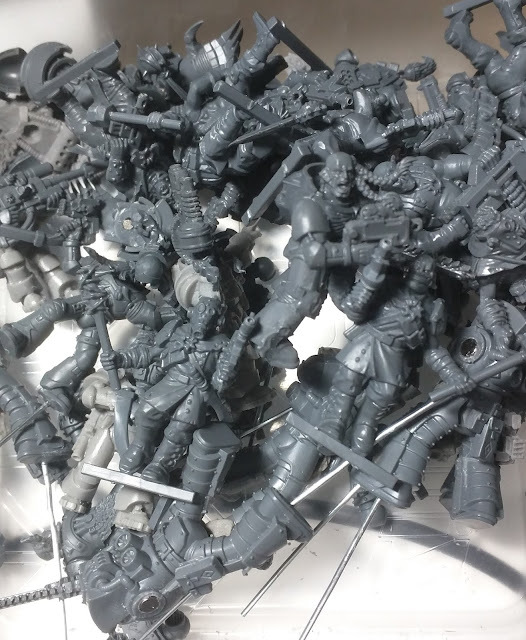 Below is the first lot ready to go for priming and base-coating. The remaining Blood Claws, Cataphractii, Wolf Scouts and about twenty (20) cultists. In this actually my final installment, Part-5 of 4. Yup, I can't count, but that's just because there are just too many good podcasts out there. Brief progress on the Praetor. Just detailing left on this one, before he is table top ready. 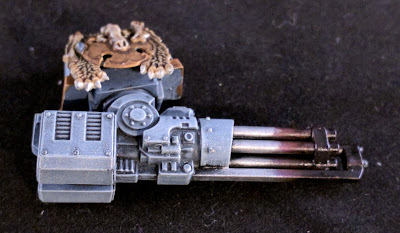 I practiced doing some barrel bluing for the Contemptor Dreadnought Kheres Assault Cannon. I still have to go back in and re-silver the lower portion of the barrel structure. It looks like it kind of worked ? More progress on Nykowna. 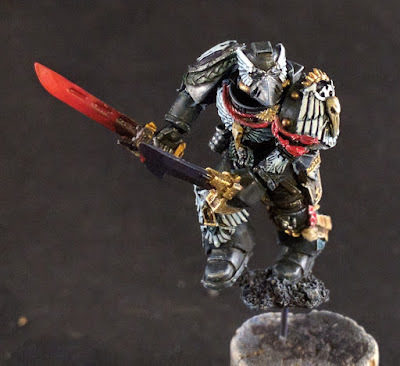 First shading washes, some initial highlighting and work on the first power sword.